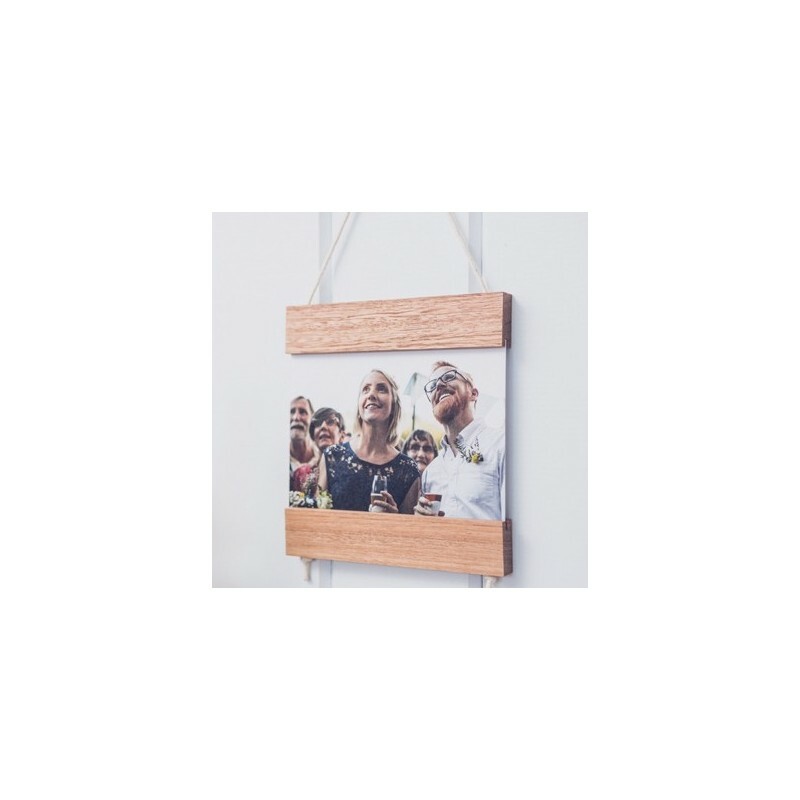 An adjustable hanging frame for greeting cards, photographs and prints. Create ever evolving wall decor by framing artwork quickly and switching your display easily. It adjusts to display different sized greeting cards, post cards, photos and prints. Just slide the top timber piece up and down the cord. Blonde coloured wood. Locally designed and made, supporting Australian business. Made from sustainable, recycled Australian timber. Designed and crafted in Brisbane, Australia. Designed to display a variety of cards and prints. 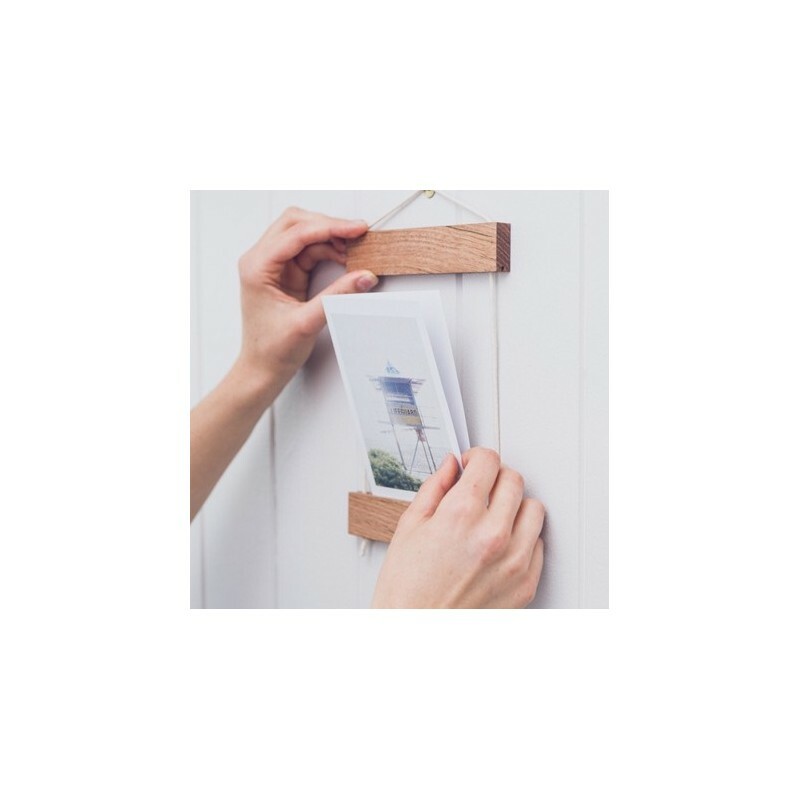 suited to display the common card size of A6 (15cm x 10cm) in portrait (vertical) or landscape (horizontal). It can also display cards that are a bit larger or a bit smaller. It extends to fit cards up to 16cm tall. A narrow card reveals the cotton cords. A wide card sits in front of the cotton cords and can extend beyond the width of the frame. Collapses for easy gifting and moving. Top of the frame can also be used as a keepsake shelf. Colour ranges between light brown and yellow coloured timbers with fair tones of ripe wheat, sandy shores and an occasional soft pinkish tinge. Colour tones and aged character vary from piece to piece making beautifully unique, premium quality frames. 25cm high x 15cm wide x 1cm deep. Australian hardwood and 100% cotton cord. 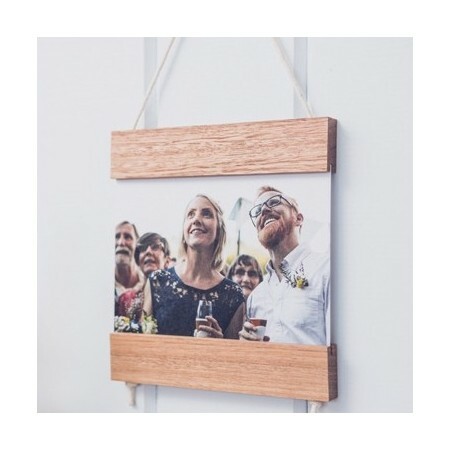 Browse our other wooden frames. I actually bought this as a Christmas present for my 8 year old niece to display photos and cards, but it is so beautiful I want one for myself! Definitely recommend.